Creative Victoria may accept applications on your behalf from an auspice organisation. Any legally constituted body may act as an auspice. In this instance, the auspice organisation will receive any funds allocated and is responsible for the management of the project and the acquittal of grant funds. It is recommended that you have a clear written agreement with your auspice organisation. The Arts Law Centre of Australia offer a sample auspice agreement for purchase from their website. As every auspicing relationship will be different and there may be additional issues that need to be included in your version of the Auspice Agreement. If this is the case please seek further assistance from the Arts Law Centre. The Creative Victoria Grants Portal accepts applications from an auspice organisations on behalf of an artist. The auspice organisation must initialise and submit the application, as well as acquit any successful grants. An auspiced artist cannot start their own application in the Grants Portal. Once an application is started on the Grants Portal, both the auspice organisation and the artist will have access to the application. You will need to work together to decide who will complete which sections of the application. If the application is successful, the auspice organisation will receive any funds allocated and is responsible for the management of the project and the acquittal of grant funds. Change of ownership of successful grants will only be accepted under limited circumstances. For an auspiced application to be submitted on the Grants Portal both the contact from the auspice organisation and the artist being auspiced need to register as individuals on the system. All individuals registered on the Grants Portal are allocated a contact code. To link an application to an artist, the artist must give the auspice organisation their contact code and the email address they registered with in advance of the application being started. Note: the artist should not share their password. 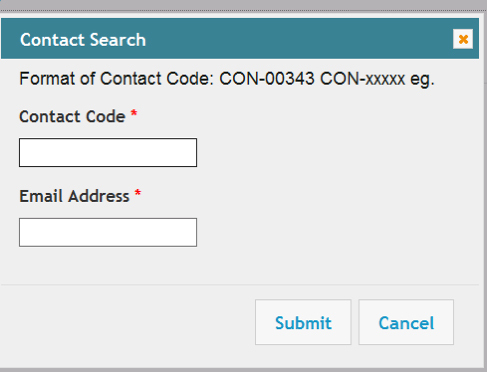 The contact code is in the Update My Contact Details section of the Grants Portal. Click on Start A New Application and select the Program, Category and Funding round. Choose Organisation in the ' Are you applying as an individual or on behalf of an organisation' dropdown list. Choose Yes to 'Are you auspicing this application?'. This will bring up the Contact Search pop-up box. Enter the artist's contact code and email address here and press Submit to link the application to the artist. Click Next to initialise the application. The Auspiced Artist Details will appear above the auspiced organisation's Account Details. The Account Details will show the legal name of the auspice body, based on the ABN you entered. If this is incorrect, re-enter the ABN into the section above. Check the auspice organisation's address is correct, and update if necessary. Enter the amount you are applying for. This can be changed later in the process. Once you have started an auspiced application it will appear in the My Applications list of both the auspiced organisation's contact and the artist. You will need to let the artist know once the application has been started. The remaining sections are to do with the artist and the project. Both auspice and artist can complete the application so you will need to be clear who is doing what, and, importantly, by what date. Remember: while you can each complete the application sections, only the auspice can submit the application. You will need to make sure the artist completes what they need to do in good time for you to be able to submit it. Neither auspice organisation or artist will be able to make changes once you submit.